Statisticians Mirko Jalava (FIN) and A. Lennart Julin (SWE) continue their ‘End of Season’ event category reviews, which cover all Athletics disciplines, highlighting the best performances which have taken place across our sport in 2012, with the HURDLES. 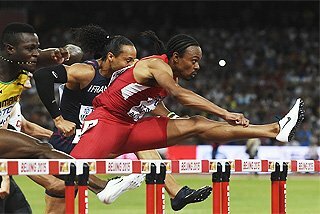 It was a great season in the men’s 110m Hurdles with the 27-year-old American Aries Merritt wining the Olympic gold medal, recording the seven fastest times of the season, going under 13 seconds no less than eight times and then finishing year with a stunning World record of 12.80 at the Samsung Diamond League final in Brussels. Merritt also won the 60m Hurdles title at the World Indoor Championships with China’s 2004 Olympic champion and former 110m World record-holder Liu Xiang in the silver medal position. The outdoor season saw both these athletes in good form early in May with Merritt running a windy 12.99, his first ever sub-13 second clocking, in Fayetteville in his heat there before clocking a legal 13.03 personal best in the final while Liu won easily at the IAAF World Challenge meeting Kawasaki, Japan, in 13.09. Liu then took the initiative with a massive win in his hometown of Shanghai at the Samsung Diamond League meeting there, clocking a fast 12.97 world-leading time in difficult conditions on a wet track, winning comfortably with Merritt back in fourth in 13.26. The duo then took their battle to Eugene where Liu recorded another great win with a wind-aided 12.87, with Merritt in second place this time in 12.96. However, the season then took a wrong turn for the Chinese star. 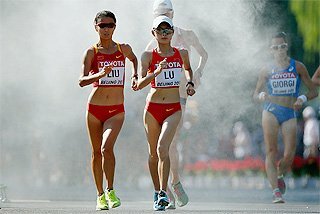 He suffered an injury at the Diamond League in London and we all know what happened at the Olympics Games, with Liu dropping out of his heat with almost a duplicate of the injury suffered in Beijing 2008. By contrast, Merritt stepped up. his 12.93 win in Eugene at the US Olympic Trials was followed by another 12.93 clocking in the London Diamond League meeting. After this there was no stopping of Merritt, who continued with yet another 12.93, his third in a row, at the Diamond League meeting in Monaco before winning in 12.92 at the Olympics. After the Olympic Games, it was all about whether Merritt would get the World record and that finally happened in Brussels where he produced an almost a perfect race to finish in 12.80. Jason Richardson had an excellent season too, but the 2011 World Championships gold medallist was overshadowed by his compatriot Merritt, although he ran a personal best of 12.98 three times and got a silver medal at his first Olympics. Behind the American pair, Jamaica’s 22-year-old Hansle Parchment was the real surprise at the Olympics with a bronze medal in a national record 13.12 while another 22-year-old, Sergey Shubenkov, clocked a Russian record 13.09 three times during the season and won at the European Athletics Championships in Helsinki. United States tops this event with 31 athletes in the world top 100. France, Great Britain, Germany and Jamaica are all tied for the second place with six men in this list. The men’s 400m hurdles was enthralling and surprising, to say the least, this year. Puerto Rico’s Javier Culson dominating the early season but a big surprise at the Olympic Games as the Dominican Republic’s 2004 champion Félix Sánchez came through to win his second Olympic title. At the start of the summer, it seemed like Culson was in full control of his destiny. The 2009 and 2011 World Championships silver medallist won his first six outings, the last three of them in under 48 seconds and last two in exactly the same world-leading time of 47.78. However, the 28-year-old lost a little momentum by the time of the Olympics, and finished third in 48.10, slower than his semifinal time of 47.93 and short of his season’s best. The home crowd in London was, naturally, hoping for another Dai Greene triumph after his 2011 World title in Daegu but that didn’t happen either. Following a sluggish start to the season, Greene seemed to be getting to shape in time before London with second place finishes behind Culson at the Samsung Diamond League meetings in Paris, with a season’s best of 47.84 in the French capital, and then London where he clocked 48.10. However, the 26-year-old Welshman only qualified for the Olympic final as the last man when he finished fourth in his semifinal in 48.24 and although he improved in the final, Greene finished out of the medals in fourth place. The Americans are usually in the mix in this event, but this year they could only boast of two athletes, and both on one occasion each, dipping under 48 seconds during the season. Both men did it in London at the Olympics, with 33-year-old 2000 and 2008 Olympic champion Angelo Taylor clocking a promising 47.95 in the semifinals. Taylor had the chance to grab his third title, but he finished in fifth place in 48.25 at his fourth consecutive Games. US Olympic Trials winner Michael Tinsley achieved a personal best 47.91 en-route to his silver medal in London but arguably one of the most surprising winners on the track in London was the 35-year-old Sanchez. 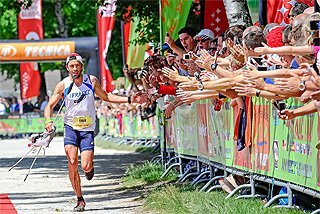 Sanchez won all the global titles during the period 2001-2004, including the Olympic gold in Athens and two World titles, but he had been far from his best form since winning the silver medal at the 2007 World Championships in Osaka. He did make the final in both 2009 and 2011 World Championships but his results were far from what they used to be and 2012 season seemed to be no different. Sanchez started his outdoor season with a 48.93 win at the IAAF World Challenge meeting in Rabat, Morocco, and arrived London with three more comparitively modest performances, and with only a 48.56 season’s best. 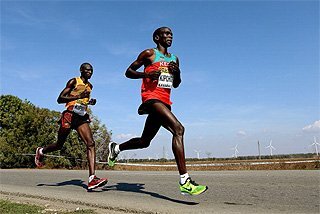 However, his relaxed heat performance showed he might be in better shape than his results had previously suggested and he was elevated to one of the medal favourites after his 47.76 world-leading time in the semifinals. 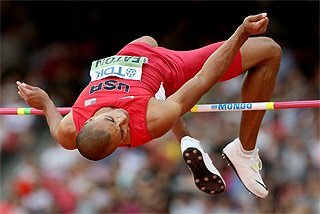 Sanchez then went on to win the gold medal in some style with 47.63, with a superb run over the last three hurdles. 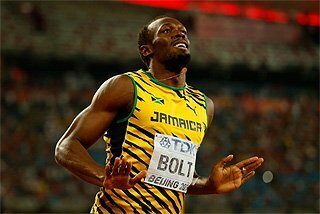 It was his fastest time in almost eight years since the Olympic final in Athens 2004, where he won with exactly the same time. 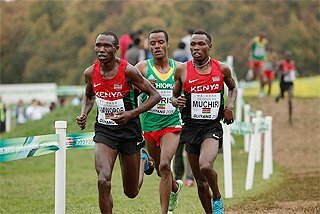 United S­­­tates is the best country in this event with 18 athletes in the world top 100 while Japan is second with 12 men. The US has an embarrassment of riches when it comes to this event and at the 2012 Olympic Trials in Eugene no less than 16 athletes dipped under 13 seconds, a group that had an age spread of between 20 and 36 and included three former global champions. In the end, experience turned out to be the key factor as the three Olympics spots were grabbed by athletes that had been around for a while: 2008 Olympic champion Dawn Harper, age 28 and qualifying for her fourth straight global outdoor championship, and the 30-year-olds Kellie Wells and two-time World Indoor Championships 60m Hurdles gold medallist Lolo Jones. 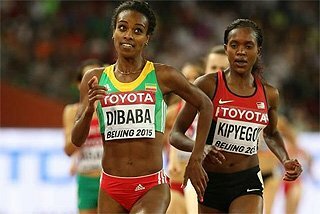 However, were any of them capable of challenging the 2011 World Athlete of the Year Sally Pearson, who had been brilliant when capturing last year’s World title in Daegu? Pearson had posted impressive times during the Australian outdoor season, took a runaway victory at the World Indoor Championships and had opened her European account by firstly tying her world-leading time of 12.49 at the Oslo Diamond League meeting and then lowering it to 12.40 in Paris, the latter mark being a time that no one but herself had surpassed in the last eight years. 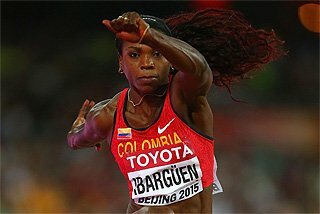 It initially seemed that barring a mistake by Pearson herself, the Olympic gold was a foregone conclusion. Nevertheless, in the London Diamond League meeting just prior to the Olympics, she found herself matched by Wells. In the heats, Pearson won by just a one-hundredth, 12.53 to 12.54, and in the final Wells was ahead by two-hundredths, 12.57 to 12.59.. However there were no mistakes by Pearson on her return to racing in the British capital although it took 12.35 to keep Harper, who reduced her personal best to 12.37 in the final, from defending her Olympic title; with the top two Beijing positions being reversed in London. Wells was a metre behind the leading pair but also set a personal best of 12.48 and was, in turn, a metre ahead of Jones. With the US occupying six of the top 10, and 10 of the top 21, on the 2012 year list the probability will remain high that the main opponents to Pearson will continue be Americans. 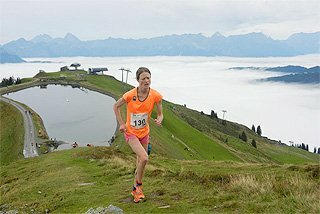 Most ready to blossom is probably the group in their early twenties, including names like Kristi Castlin, Queen Harrison, Christina Manning and Brianna Rollins; and it’s worth remembering that Olympic bronze medalist Wells didn’t really come into her own as an international contender until last year at age 29. Canada has taken over from Jamaica the position as the second strongest nation in terms of depth as the familiar faces of Priscilla Lopes-Schliep, Perdita Felicien and Angela Whyte have been joined as consistent top-level performers by Phylicia George, Jessica Zelinka (although she is primarily a heptathlete) and Nikkita Holder to give the nation no less than six athletes in the 12.64 to 12.93 range in 2012. Currently the top European hurdler, at least in terms of major championships in the individual event, comes out of Turkey in the form of Nevin Yanit, as proven by her fifth place in the Olympics where she ran a national record of 12.58 in both the semifinals and final, and her emphatic defence of her title at the European Athletics Championships. However, Great Britain’s Jessica Ennis was the fastest European hurdler in 2012 after he sparkling start to the Olympic Games heptathlon when she ran a national record of 12.54. Russia’s Natalya Antyukh was a 400m specialist for much of her senior career, getting a bronze at the 2004 Olympics, who only at age 28 decided to try the going over the barriers seriously, although she had been a promising hurdler as teenager. However, it has proved to be a profitable switch. She first won the 2010 European 400m Hurdles title in her first year at the event and now she has an individual Olympic gold medal to her name after a great duel with the US 2011 World Championships gold medallist Lashinda Demus. Antyukh had established that she was the women to watch when she won at the Russian Championships in 53.40 but Demus was ahead for the first seven hurdles in the final. They came over the eighth barrier together before Antyukh just started to edge in front down the home straight, the Russian crossing the line in 52.70 to Demus’s 52.77. 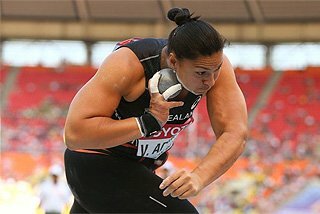 The Russian moved up to sixth on the world all-time list while Demus was just three-tenths shy of her US record set when winning at the 2011 World Championships. Behind the leading pair, Czech Republic's Zuzana Hejnová had only managed to finish fourth at the European Athletics Championships, won by another Russian Irina Davydova, but rose to the occasion in London to take the bronze medal in 53.38. Early season leader Davydova made a big breakthrough at Sochi in May when she ran what was then a world-leading time of 53.87 and went even faster in Helsinki to win her continental title in 53.77 but ran out of steam by the time of the Olympics and only made the semifinals. Just out of the medals in London was Jamaica’s luckless Kaliese Spencer. Spencer, the 2006 World Junior Championships gold medalist, not only finished fourth at the Olympic Games but had also finished in the same, dreaded, position at the last two World Championships. However, post-London she rattled off three good wins, including a 53.49 run in Lausanne and victory in the Samsung Diamond league final in Brussels. Jamaica’s other big hope, 2008 Olympic champion Melaine Walker, wasn’t quite at her very best in London and the defence of her title ended in the semifinals. 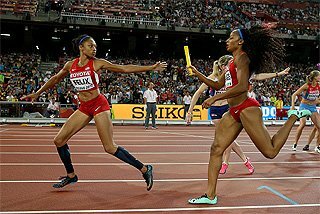 However, she did bounce back to some effect when she ran 53.74 to finish behind Spencer in Lausanne two weeks after the end of the Olympics. Two tremendous prospects in the event emerged in 2012. Czech Republic’s Denisa Rosolova took the silver medal behind Davydova in Helsinki, in her first serious year at the event, running a personal best of 54.24 despite some rather ragged hurdling technique. She then finished seventh at the Olympics and it's worth remembering that Rosolova was the 2005 European Junior champion and is also the 2011 European Athletics Indoor Championships 400m gold medallist. There is also another good young Jamaican on the horizon, Janeive Russell, who was an impressive winner at the 2012 IAAF World Junior Championships in 56.62.